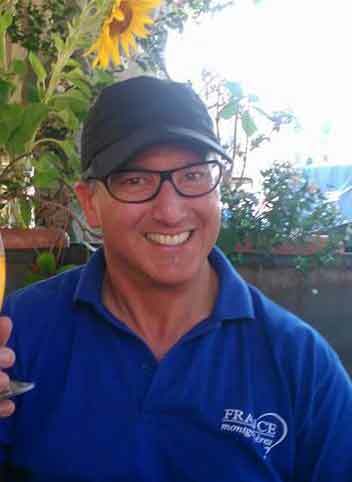 Managing Director David’s route to France thirty years ago from New Jersey, was in the form of an exciting transatlantic sailing adventure – a mission to bring a yacht over to Europe. And then he stayed. In deciding to settle in Burgundy David infact was returning to the very region of his ancestral roots. He fell in love with the way of life, the traditions and local culture. His passion for boats lead him to begin his Burgundian life as captain of luxury barge hotels. It was during this time spent on the waterways of France that his life turned towards ballooning – the idea of providing flights for his barging clients was born and he worked enthusiastically to make it become a reality. Whilst working on the canals he met his future partner Mark. Having obtained his commercial licence David spent some time gaining flying experience in Kenya before returning to Burgundy in 1985. He set up the present France Montgolfières Balloon Company – a company entirely devoted to hot air ballooning in France. For the last 30 years, he has never stopped adding to the range of products & possibilities offered by France Montgolfières, always with great enthusiasm. David is the Managing Director of the company. RN, RE Mark has been flying balloons for over twenty years. His first meeting with aerostats was in his home town of Hay-on-Wye (U.K.) with Jerry Turnbull. In 1984, licence in hand, it was in Gstaad in Switzerland where Mark spent the next five years flying in the Alps and developing techniques and equipment. During the off season periods he worked on exclusive adventure ballooning trips on different continents :– Africa Asia, Europe and the Americas. Eventually settling in Burgundy he joined his already established ballooning friend David La Beaume and together they set up France Montgolfières Balloon Company. 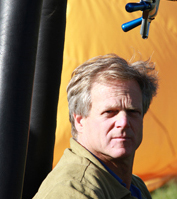 Whichever form of ballooning: flying people, location filming or a publicity shot, Mark continues to share his enthusiasm and passion for ballooning with others. As a pilot instructor and examiner he enjoys passing on his knowledge and expertise to new would-be balloon pilots. The maintenance and technical base is his domain: Mark is Technical Director of France Montgolfières. Here are the pilots you could be flying with when you chose France Montgolfières. Pierre started flying in 1987, since then he has flown in France, Morocco, Myanmar, French Polynesia and Turkey. 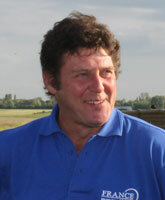 Adrian first discovered ballooning in the Loire Valley in 1994 . He followed in house training to become a pilot and has since flown in France, Switzerland, Egypt Mexico et Australia. Adrian is the base manager in the Paris region. René started flying in 1986. He flies in Fontainebleau, in the Paris region. Thierry discovered ballooning in his native Belgium, 14 years ago. Since then he has flown in Belgium, Namibia and France. Thierry is the base manager in the Loire Valley. Fernando is the chief Pilot in Provence. He began his career in 2000 and now spends his time in Provence for the summer months and in the winter time Chile and Myanmar.